In a pot melt butter and add flour, cook for 3 minutes whisking constantly. Add milk and whisk constantly till mixture boils. Add the cheese and whisk until fully incorporated. Add the macaroni to cheese sauce and mix well. Place jalapeno directly into the flame of the stove to char. Cook for 2 minutes turn once and cook the skin until black. Remove jalapeno from the fire and warp in a wet paper towel for 5 minutes. Remove paper towel and the skin, remove seeds and chop coarsely set aside. Heat sauté pan over medium heat, add oil. When it starts to lightly smoke add shrimp and cook for 2 minutes or until done. Season with salt and pepper. 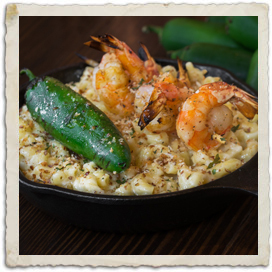 Set 8 shrimp aside for garnish, add rest of the shrimp, jalapeno to mac and cheese. Garnish with shrimp, Parmesan, breadcrumbs and parsley.